Dedicated to that intrepid host of believers in the Navajo Nation and among all other peoples at Ts’ahtah — the mission in the sagebrush . . . I spent much of last week at this “mission in the sagebrush,” acclimating myself to the unique, beautiful, and rugged area where members of the Brethren in Christ Church once had their first encounter with the Navajo (Diné) in the late 1949s. After the jump: some background on the Mission and the celebration captured in today’s photo. The land purchased for the mission site, on Otis Hill . . . was (and is) about 30 miles south of Bloomfield, on the Chaco Canyon Road, two miles off Route 44 [now U.S. 550], the main highway between Farmington and Albuquerque. Over the years, Mission workers have established a number of ministries aimed at improving the spiritual and physical/economic condition of their Navajo (Diné) brothers and sisters: from the relatively recent Overcomers program (which walks recovering addicts through a time of spiritual, physical, and emotional renewal) to the medical services offered almost from the inception of the Mission. [The hospital] is a monument to no one, but rather an institution raised to the honor and glory of our Lord Jesus Christ, the Great Physician. Throughout the 1950s, 1960s, and 1970s, the Navajo Hospital — as it was colloquially called — was one of the most significant outreach and service centers at the Mission. 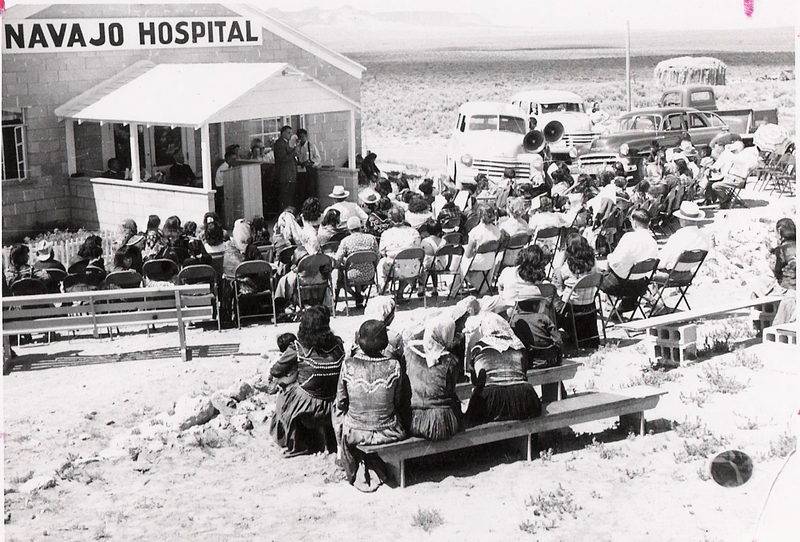 Hostetler reports that from 1956-1973, more than 8,500 patients were admitted and more than 2,500 babies delivered; between 1950 (when the Mission opened a clinic that preceded the hospital) and 1976, more than 70 men and women — many of whom were Navajo (Diné) — served as doctors, RNs, LPNs, nurses aides, cooks, and in other capacities at the hospital. Today, a memorial garden on the Mission’s campus commemorates the hospital. For more on the history of the Mission (including the hospital), see Hostetler’s A Mission to Bring Living Water to a Thirsty Land; Carlton O. Wittlinger’s Quest for Piety and Obedience (Nappanee, Ind. : Evangel Press, 1978), 452-453, 467, 502-503; and Carolyn Kimmel’s In the Nations: The Brethren in Christ on Mission Around the World (Grantham, Pa.: Brethren in Christ World Missions, 2007), 19-24. Find out more about the Mission’s ongoing work at its website.